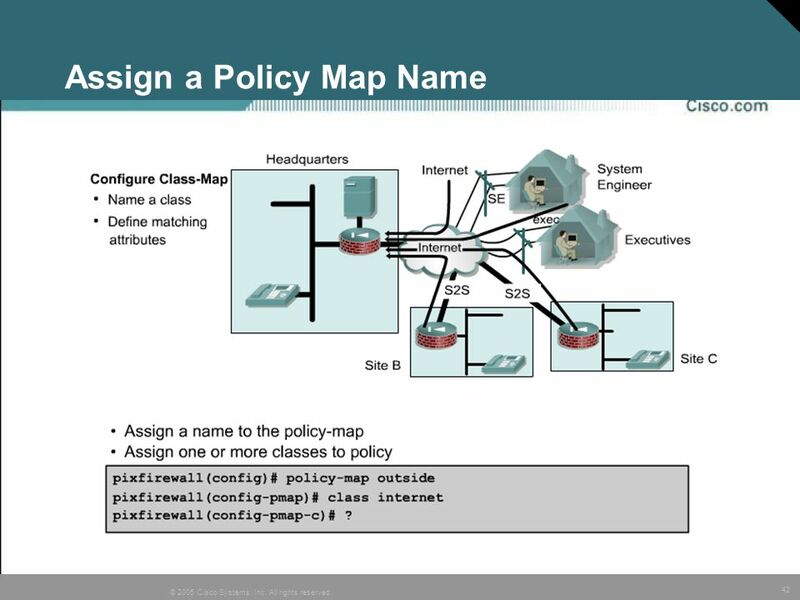 © 2004, Cisco Systems, Inc. All rights reserved. 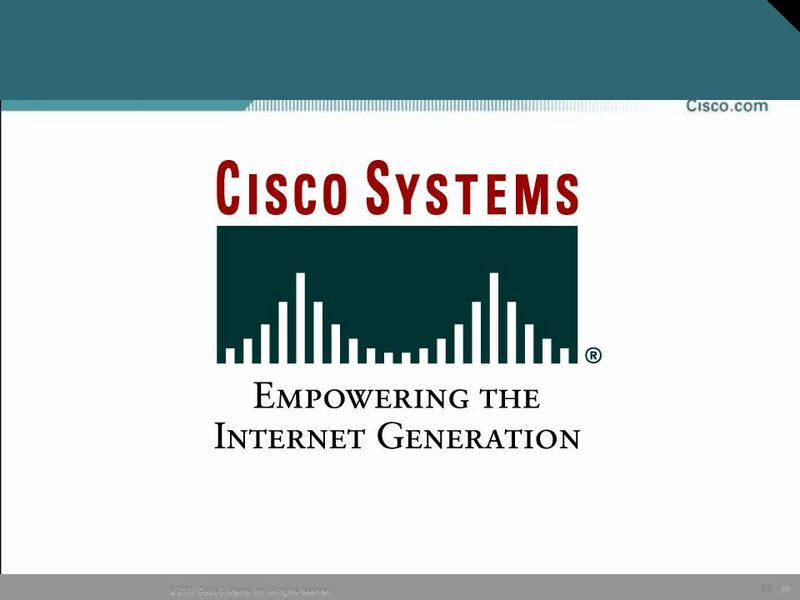 1 © 2004, Cisco Systems, Inc. All rights reserved. 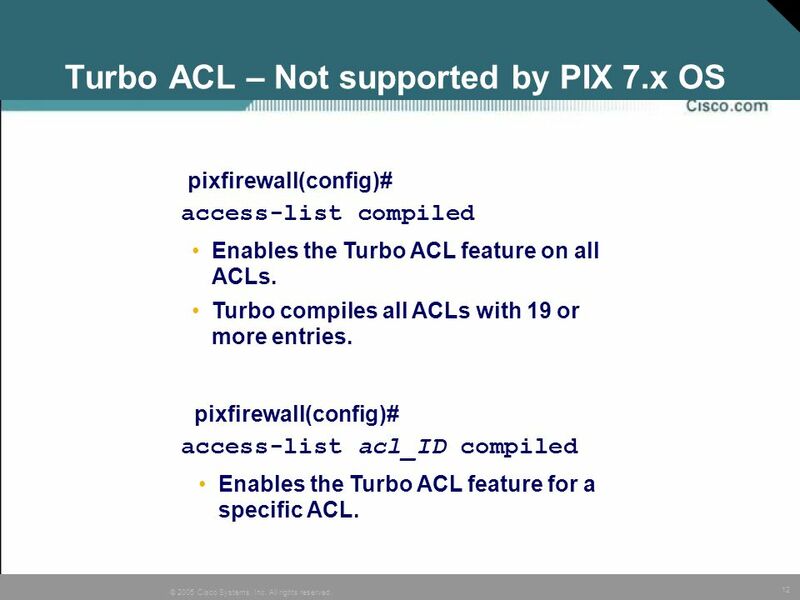 pixfirewall(config)# access-list compiled Enables the Turbo ACL feature on all ACLs. Turbo compiles all ACLs with 19 or more entries. Not supported 501 Enabling debugging might have significant impact to the performance because of potential massive output to the console. 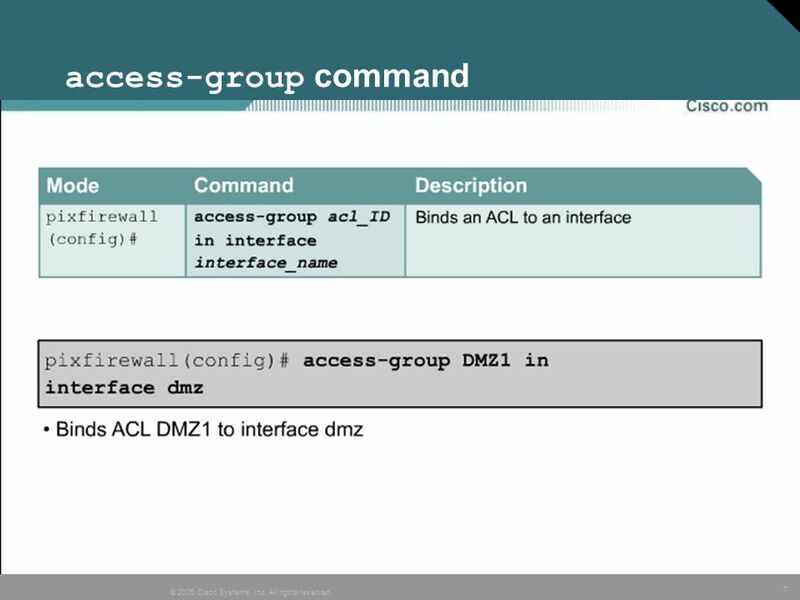 pixfirewall(config)# access-list acl_ID compiled Enables the Turbo ACL feature for a specific ACL. 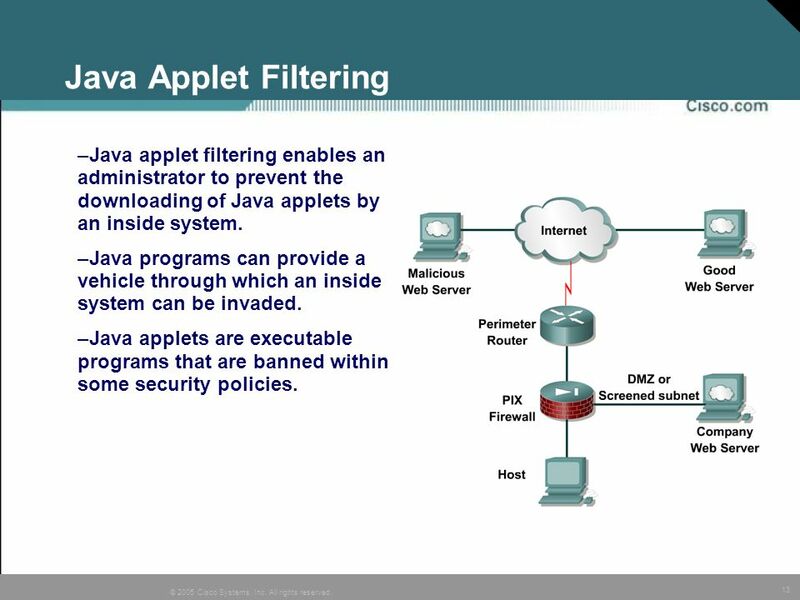 13 Java Applet Filtering Java applet filtering enables an administrator to prevent the downloading of Java applets by an inside system. Java programs can provide a vehicle through which an inside system can be invaded. Java applets are executable programs that are banned within some security policies. 14 ActiveX Blocking ActiveX controls are applets that can be inserted in web pages or other applications. 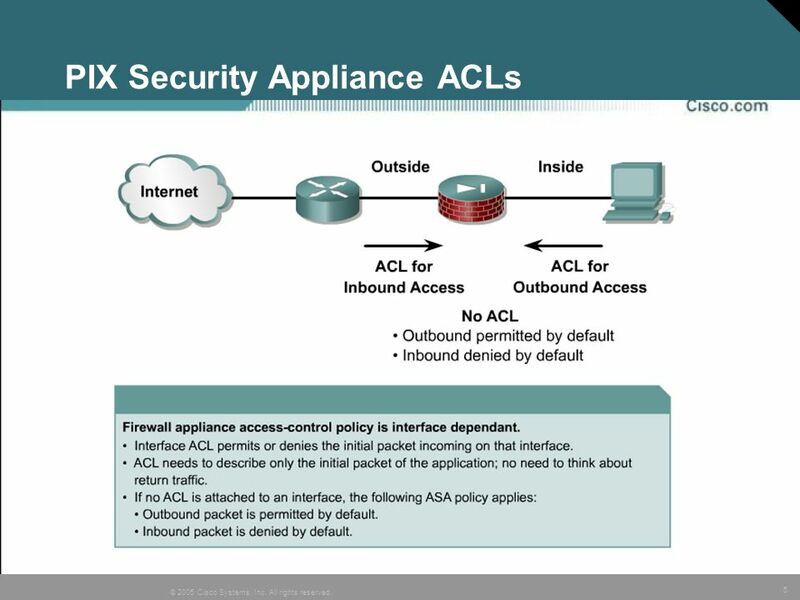 ActiveX controls can provide a way for someone to attack servers. 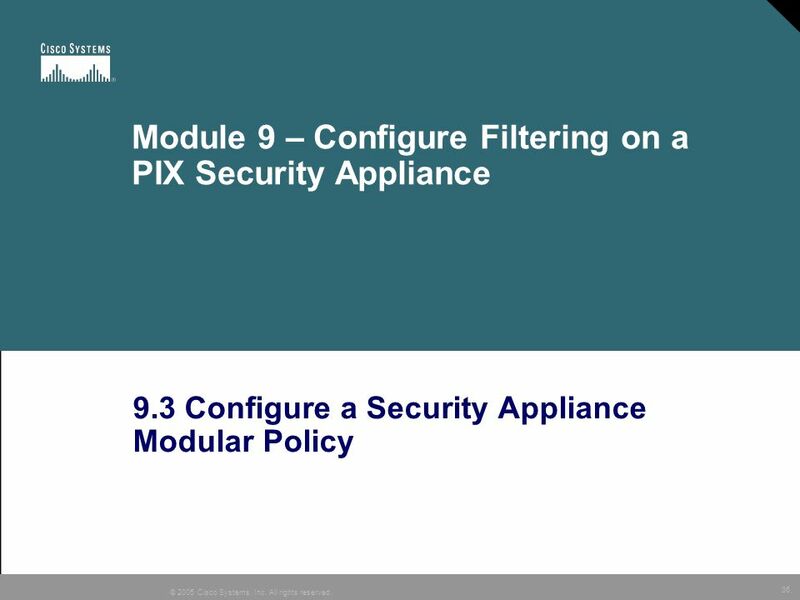 The PIX Security Appliance can be used to block ActiveX controls. 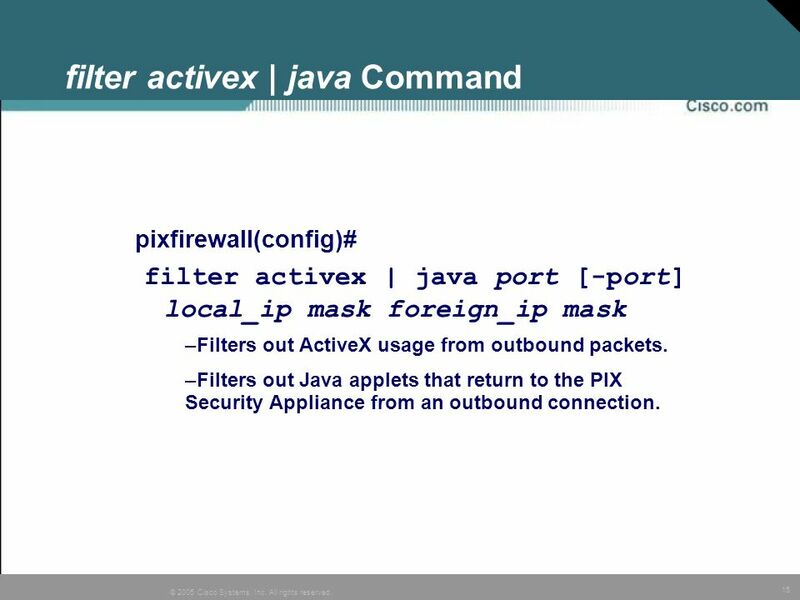 pixfirewall(config)# filter activex | java port [-port] local_ip mask foreign_ip mask Filters out ActiveX usage from outbound packets. Filters out Java applets that return to the PIX Security Appliance from an outbound connection. 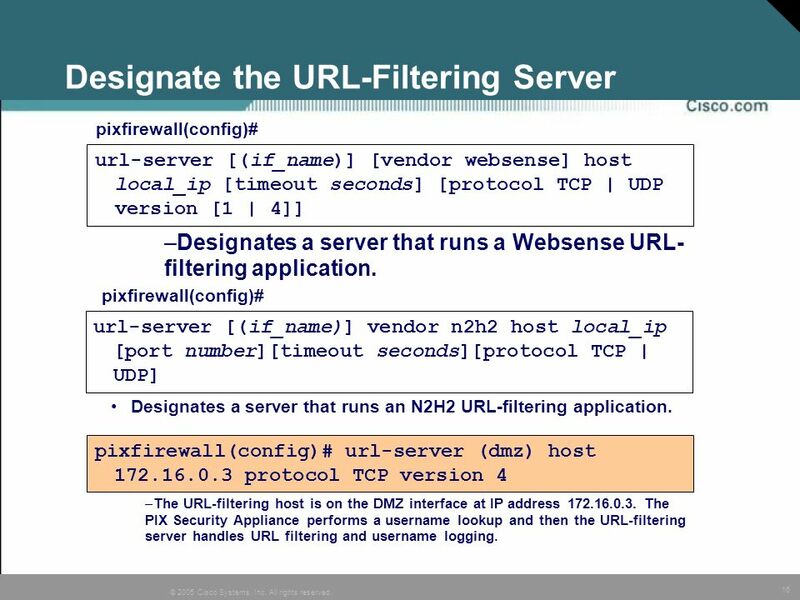 pixfirewall(config)# url-server [(if_name)] [vendor websense] host local_ip [timeout seconds] [protocol TCP | UDP version [1 | 4]] Designates a server that runs a Websense URL-filtering application. 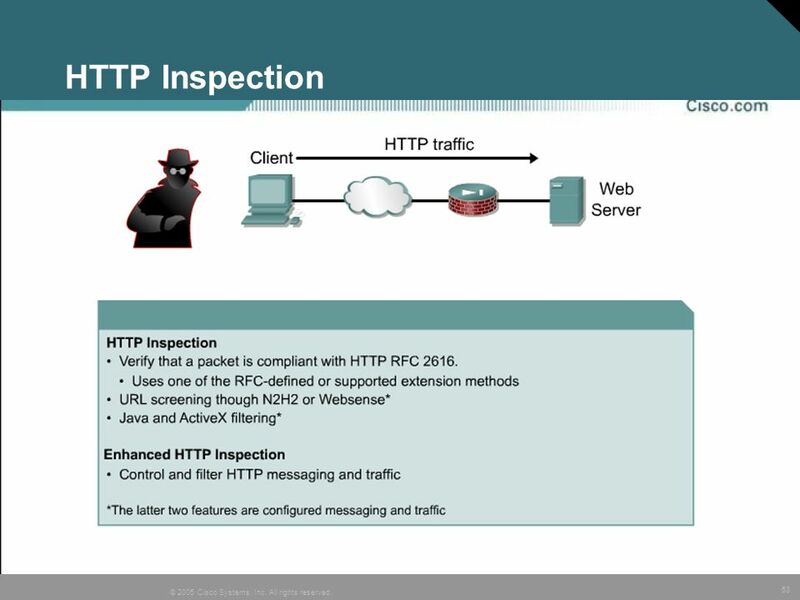 pixfirewall(config)# url-server [(if_name)] vendor n2h2 host local_ip [port number][timeout seconds][protocol TCP | UDP] With version 4 option, the PIX performs a username lookup, and then the Websense server handles URL filtering and username logging. With the version 1 option, everything works the same as in previous PIX Security Appliance versions. Username logging tracks username, group, and domain name on the Websense server. Username lookup enables the PIX Security Appliance to use the user authentication table to map the host's IP address to the username. Designates a server that runs an N2H2 URL-filtering application. 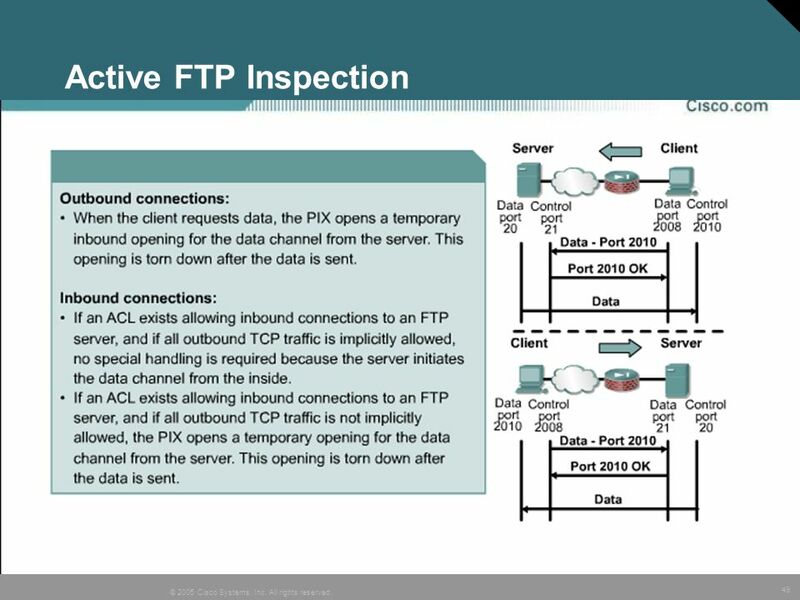 pixfirewall(config)# url-server (dmz) host protocol TCP version 4 The URL-filtering host is on the DMZ interface at IP address The PIX Security Appliance performs a username lookup and then the URL-filtering server handles URL filtering and username logging. pixfirewall(config)# filter url port[-port] | except local_ip local_mask foreign_ip foreign_mask [allow] [proxy-block] [longurl-truncate | longurl-deny][cgi-truncate] Prevents outbound users from accessing URLs that are designated with the URL-filtering application. 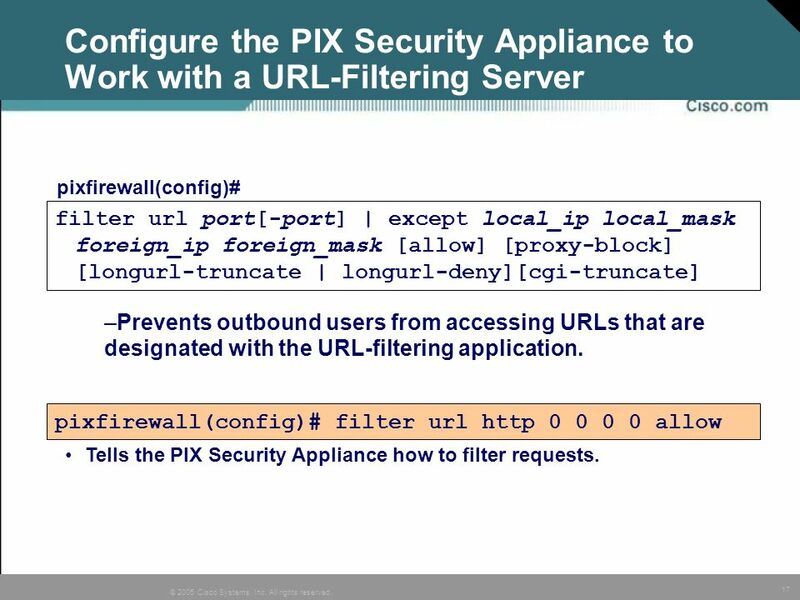 pixfirewall(config)# filter url http allow Tells the PIX Security Appliance how to filter requests. 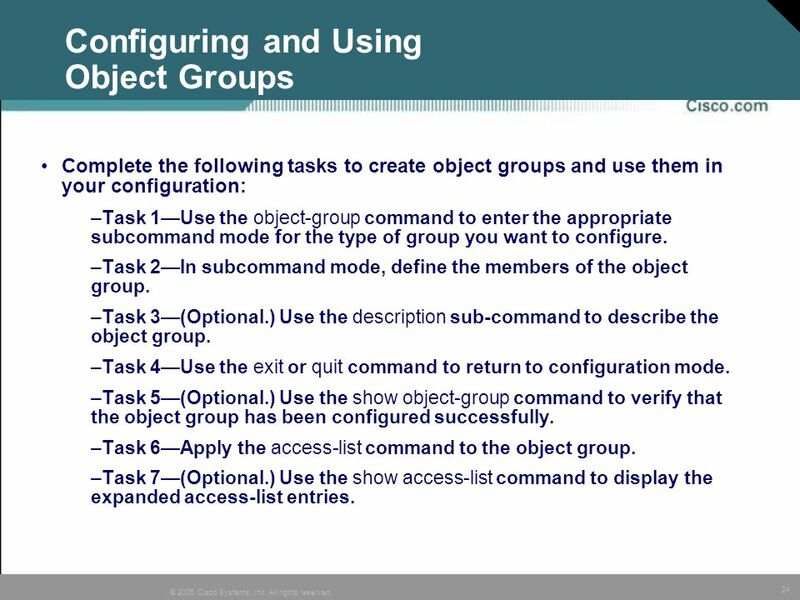 Complete the following tasks to create object groups and use them in your configuration: Task 1—Use the object-group command to enter the appropriate subcommand mode for the type of group you want to configure. 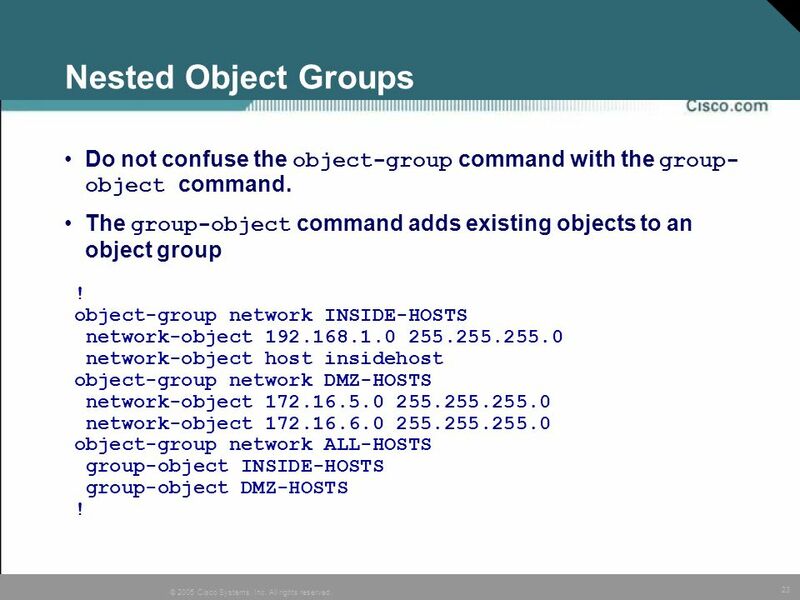 Task 2—In subcommand mode, define the members of the object group. Task 3—(Optional.) Use the description sub-command to describe the object group. Task 4—Use the exit or quit command to return to configuration mode. Task 5—(Optional.) Use the show object-group command to verify that the object group has been configured successfully. 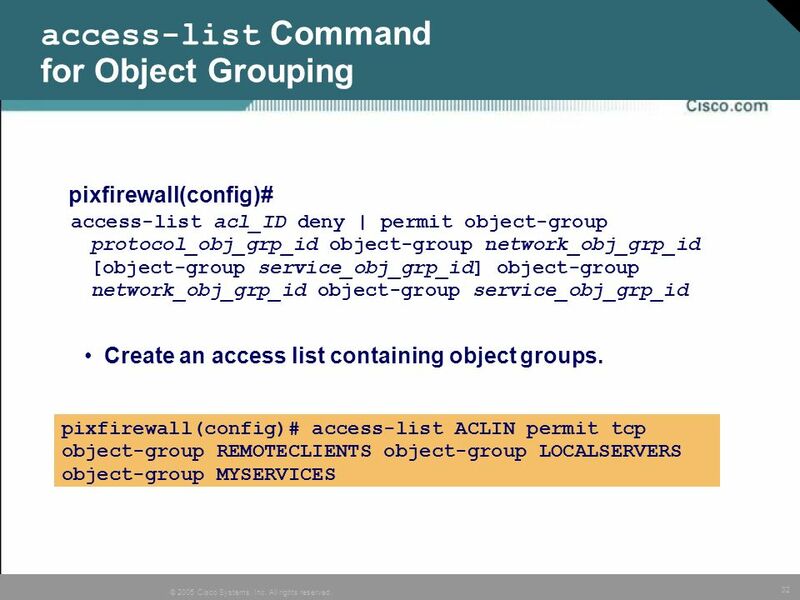 Task 6—Apply the access-list command to the object group. Task 7—(Optional.) 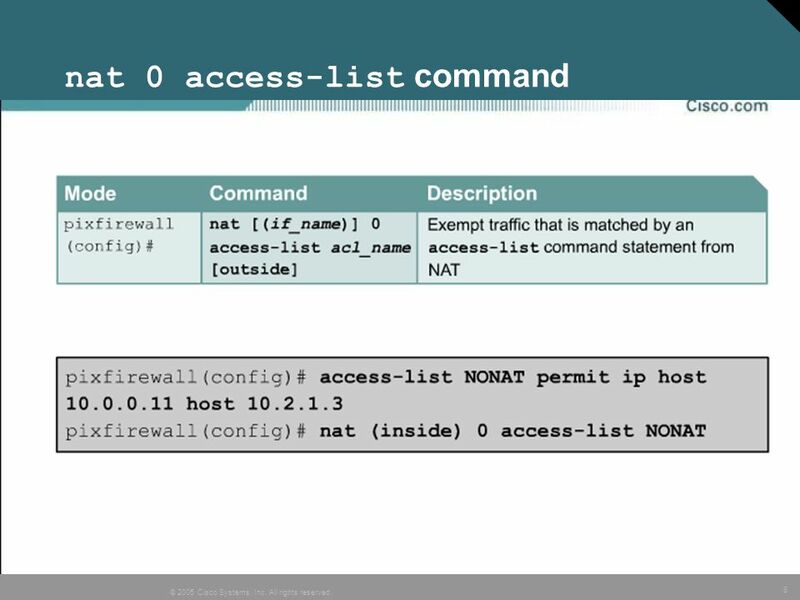 Use the show access-list command to display the expanded access-list entries. 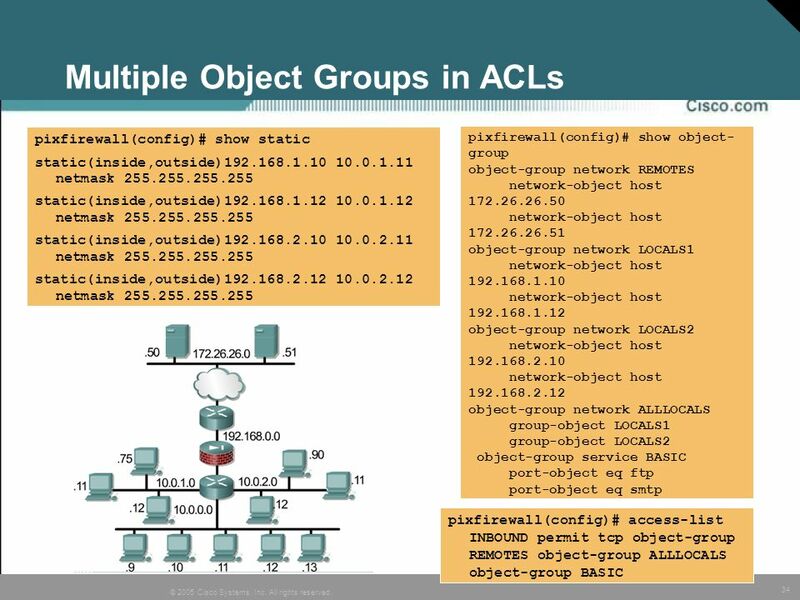 pixfirewall(config)# object-group network grp_id Assigns a name to a Network group and enables the Network subcommand mode. 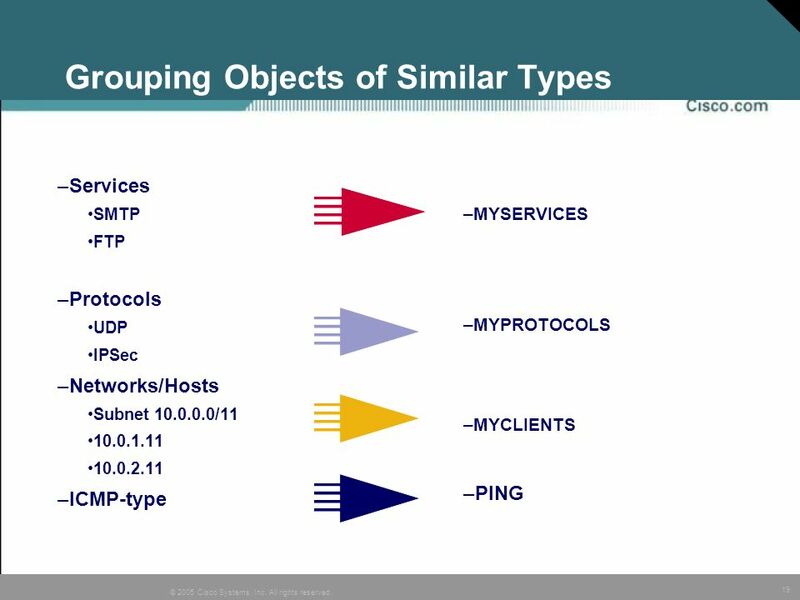 pixfirewall(config)# object-group service grp_id tcp | udp | tcp-udp Assigns a name to a Service group and enables the Service subcommand mode. pixfirewall(config)# object-group protocol grp_id Assigns a name to a Protocol group and enables the Protocol subcommand mode. 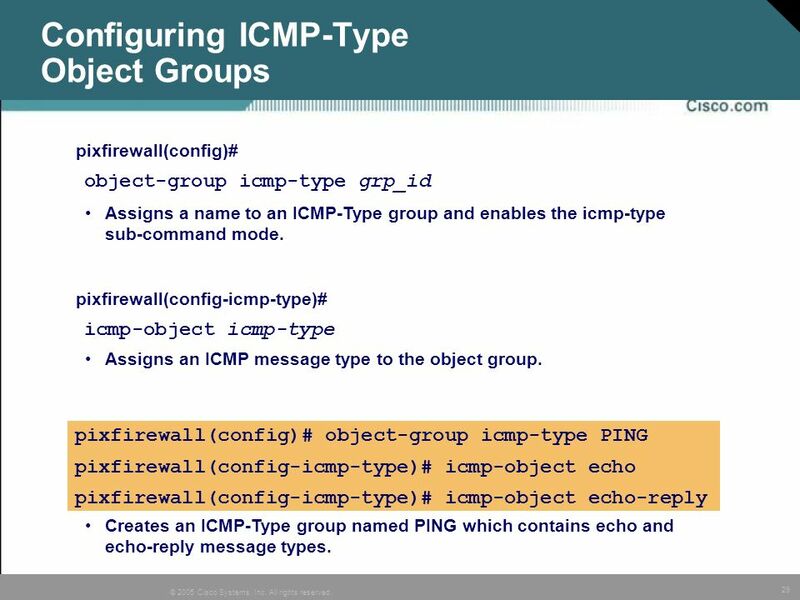 pixfirewall(config)# object-group icmp-type grp_id Assigns a name to an ICMP-type group and enables the ICMP-type subcommand mode. 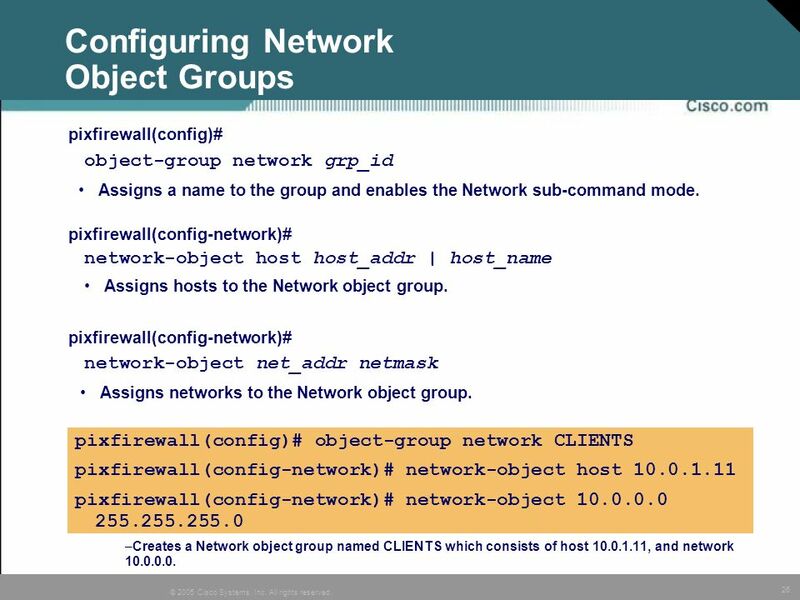 pixfirewall(config)# object-group network CLIENTS Assigns the name CLIENTS to a Network group and enables the Network subcommand mode. pixfirewall(config)# object-group service grp_id tcp | udp | tcp-udp Assigns a name to a Service group and enables the Service sub-command mode. pixfirewall(config-service)# port-object eq service Assigns a single TCP or UDP port number to the Service object group. pixfirewall(config-service)# port-object range begin_service end_service Assigns a range of TCP or UDP port numbers to the Service object group. 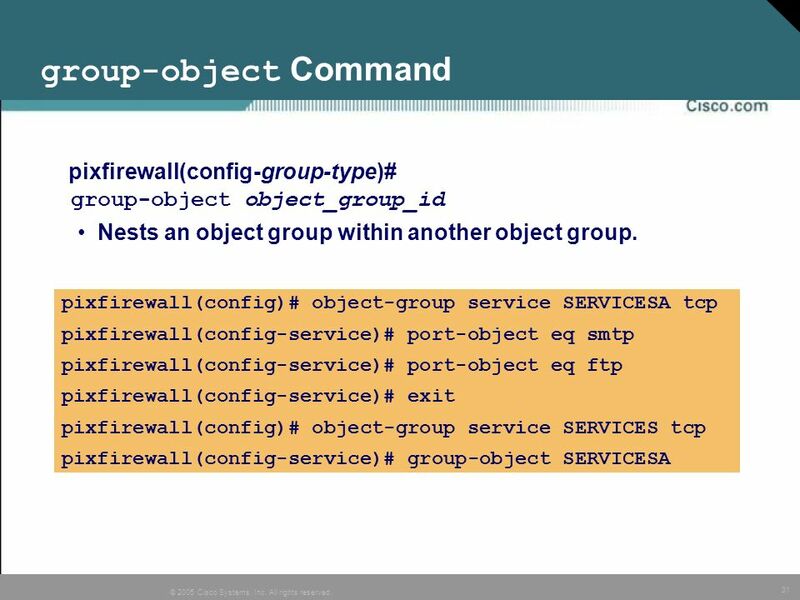 pixfirewall(config)# object-group service MYSERVICES tcp pixfirewall(config-service)# port-object eq http pixfirewall(config-service)# port-object eq ftp Creates a Service group named MYSERVICES, which contains HTTP and FTP. 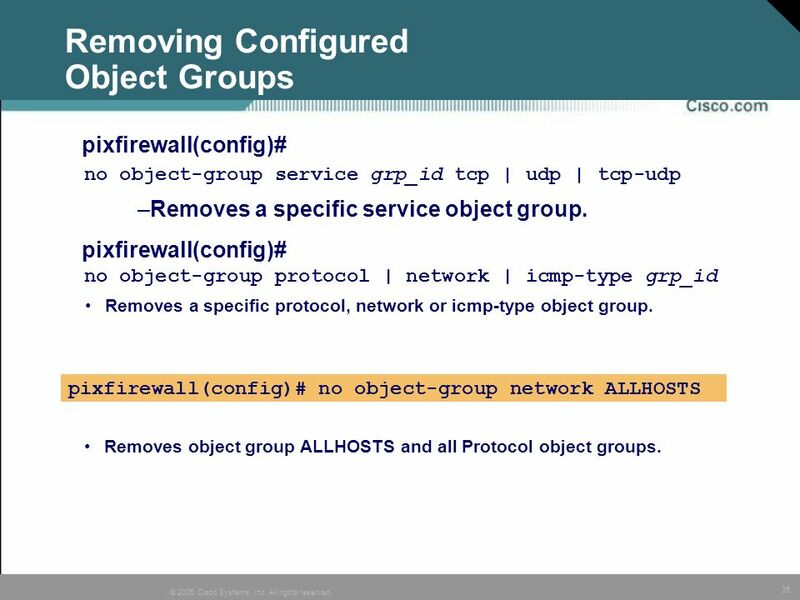 pixfirewall(config)# object-group protocol grp_id Assigns a name to a Protocol group and enables the Protocol sub-command mode. 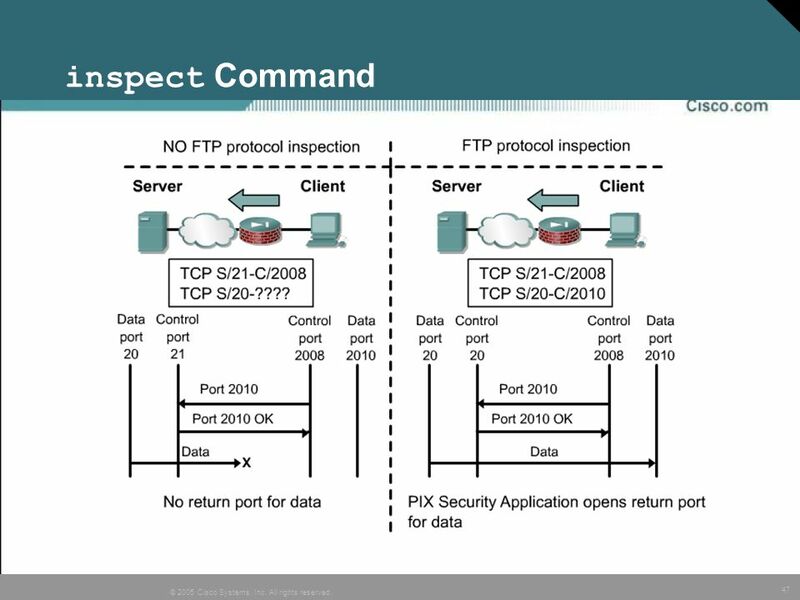 pixfirewall(config-protocol)# protocol-object protocol Assigns a protocol to the Protocol object group. 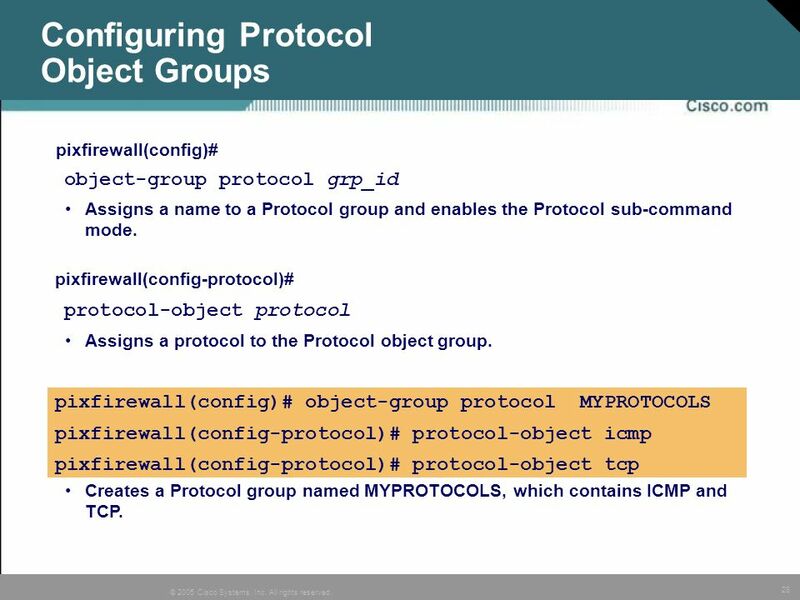 pixfirewall(config)# object-group protocol MYPROTOCOLS pixfirewall(config-protocol)# protocol-object icmp pixfirewall(config-protocol)# protocol-object tcp Creates a Protocol group named MYPROTOCOLS, which contains ICMP and TCP. 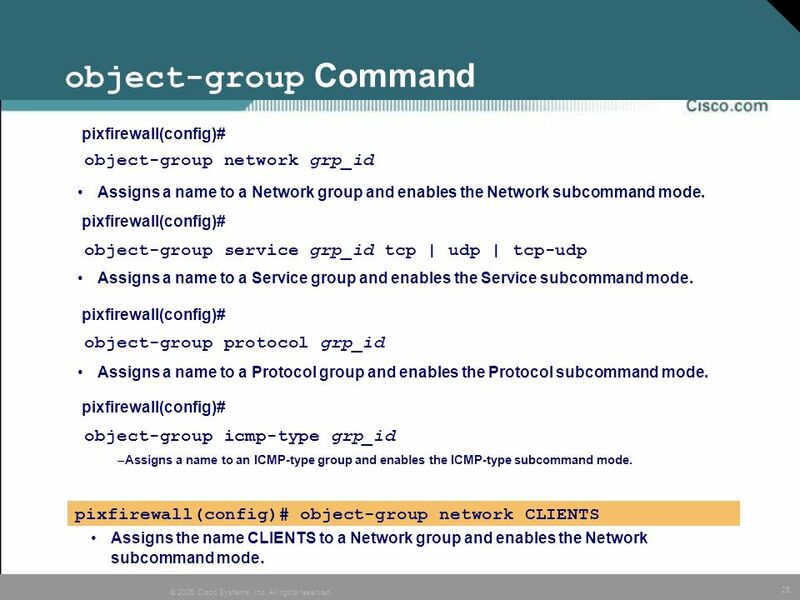 pixfirewall(config)# object-group icmp-type grp_id Assigns a name to an ICMP-Type group and enables the icmp-type sub-command mode. 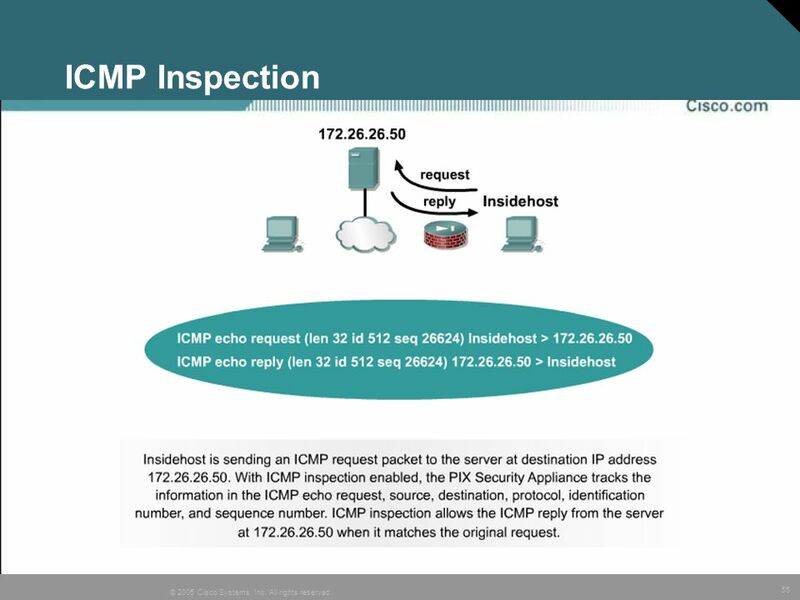 pixfirewall(config-icmp-type)# icmp-object icmp-type Assigns an ICMP message type to the object group. 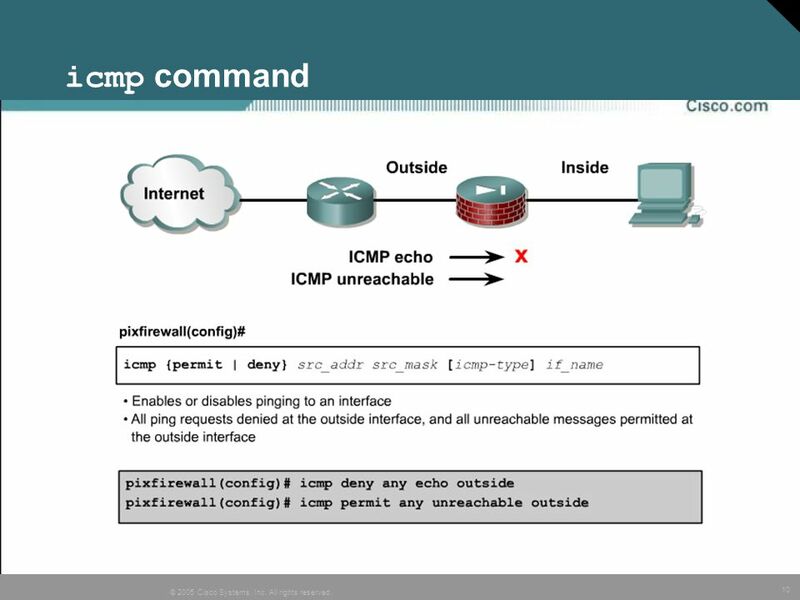 pixfirewall(config)# object-group icmp-type PING pixfirewall(config-icmp-type)# icmp-object echo pixfirewall(config-icmp-type)# icmp-object echo-reply Creates an ICMP-Type group named PING which contains echo and echo-reply message types. 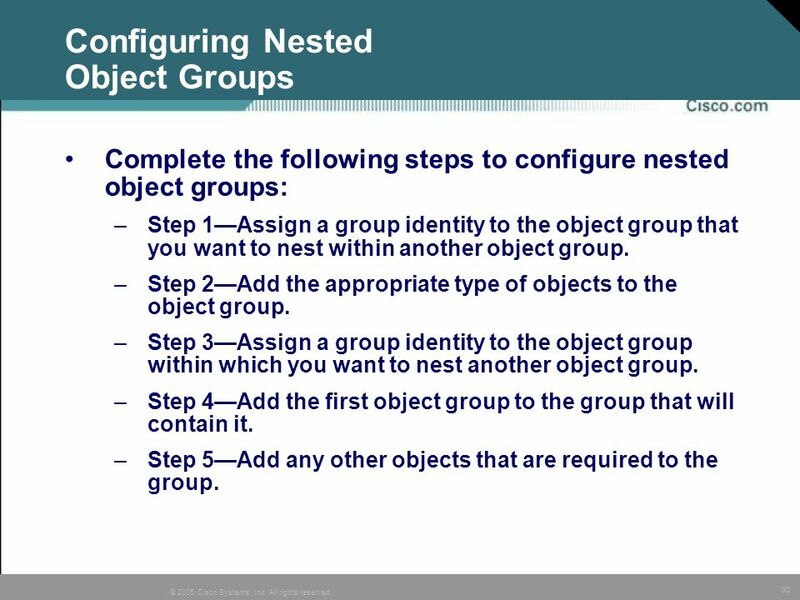 Complete the following steps to configure nested object groups: Step 1—Assign a group identity to the object group that you want to nest within another object group. Step 2—Add the appropriate type of objects to the object group. 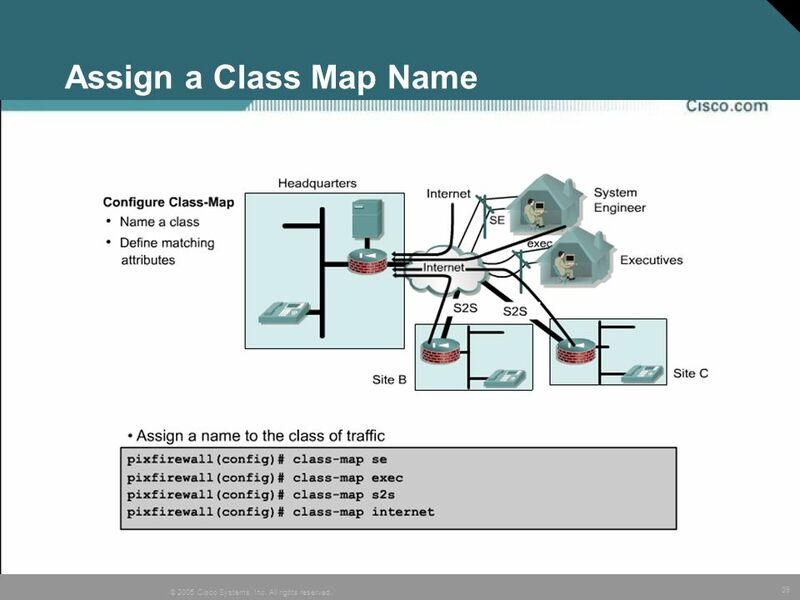 Step 3—Assign a group identity to the object group within which you want to nest another object group. Step 4—Add the first object group to the group that will contain it. Step 5—Add any other objects that are required to the group. pixfirewall(config)# no object-group service grp_id tcp | udp | tcp-udp Removes a specific service object group. 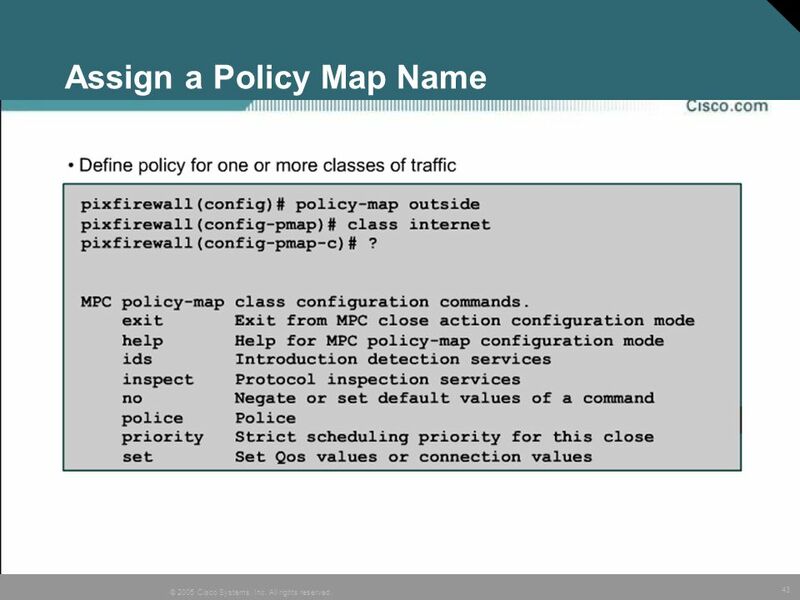 pixfirewall(config)# no object-group protocol | network | icmp-type grp_id Removes a specific protocol, network or icmp-type object group. pixfirewall(config)# no object-group network ALLHOSTS Removes object group ALLHOSTS and all Protocol object groups. 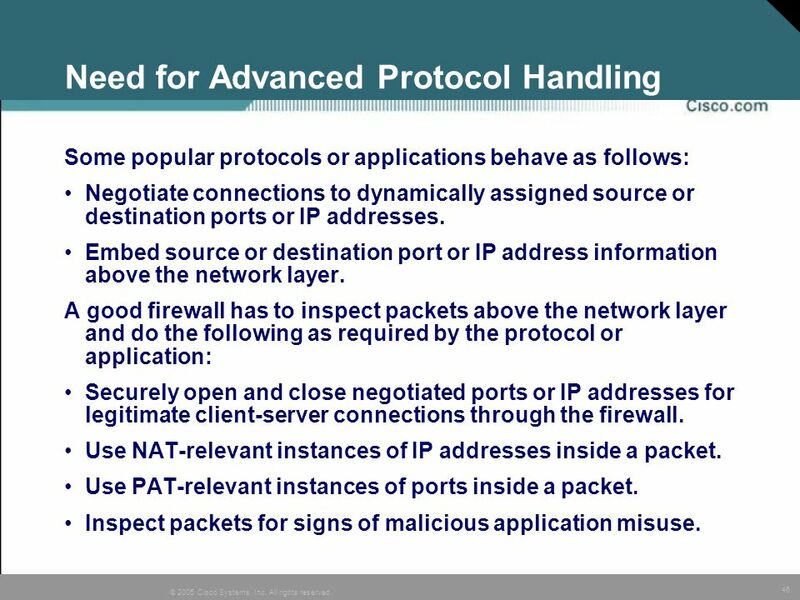 Some popular protocols or applications behave as follows: Negotiate connections to dynamically assigned source or destination ports or IP addresses. 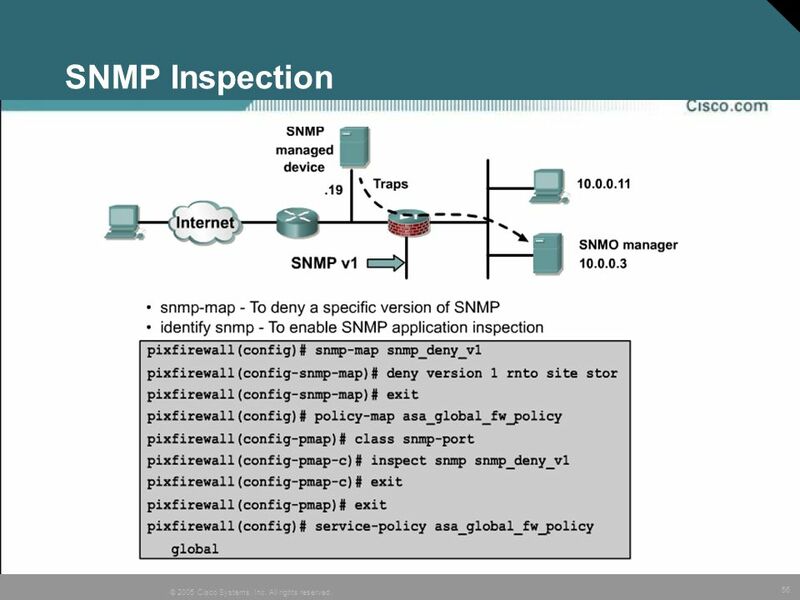 Embed source or destination port or IP address information above the network layer. 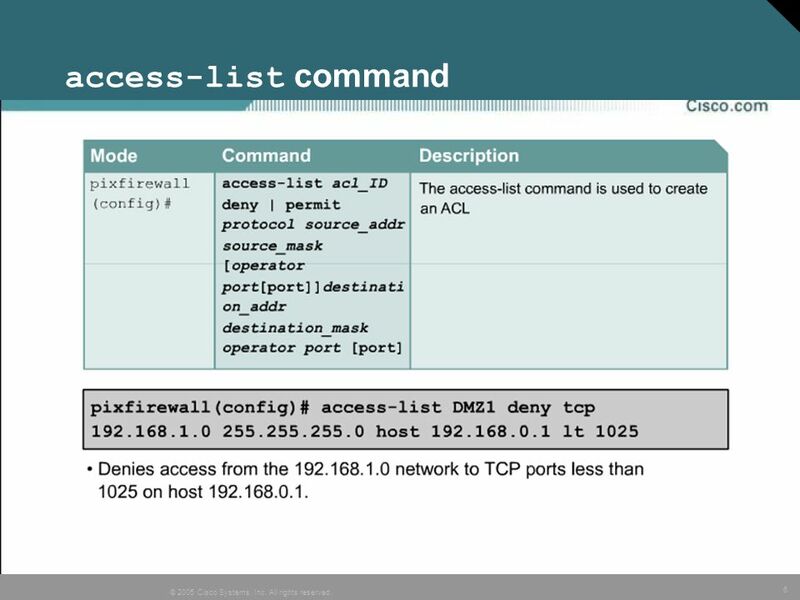 A good firewall has to inspect packets above the network layer and do the following as required by the protocol or application: Securely open and close negotiated ports or IP addresses for legitimate client-server connections through the firewall. 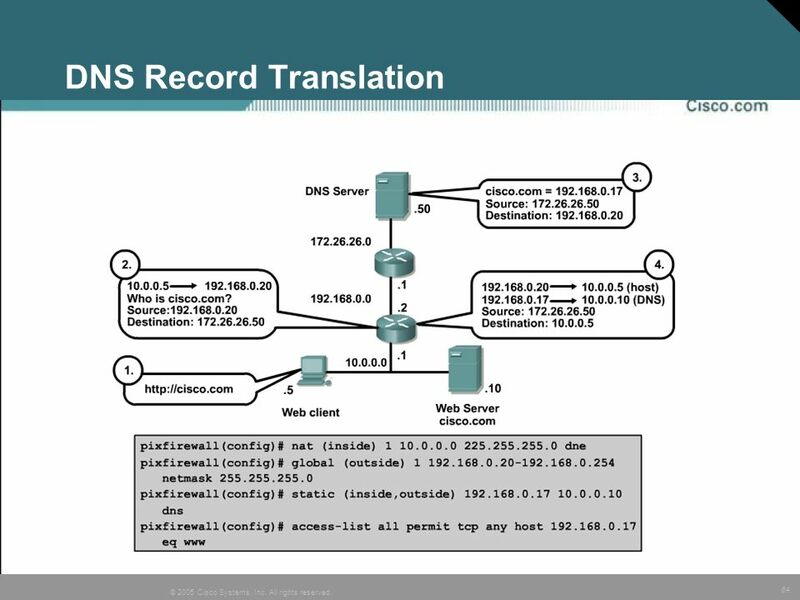 Use NAT-relevant instances of IP addresses inside a packet. Use PAT-relevant instances of ports inside a packet. 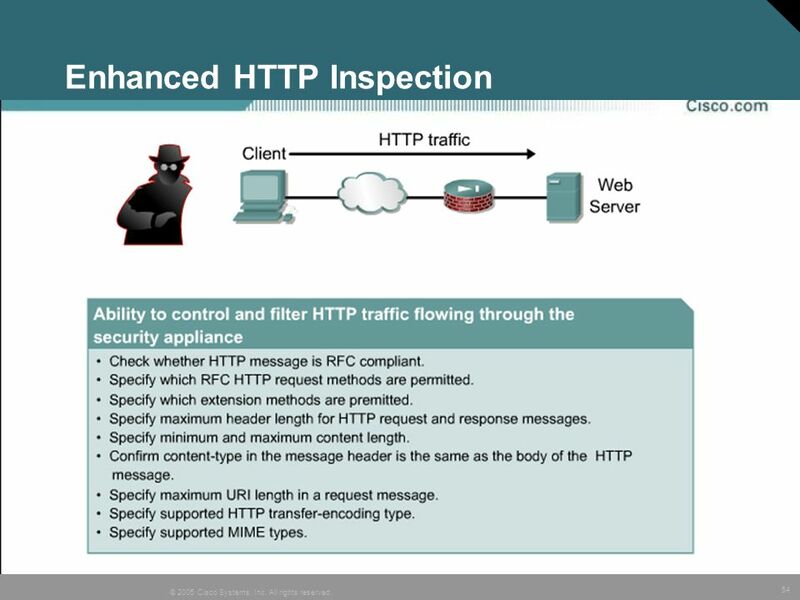 Inspect packets for signs of malicious application misuse. 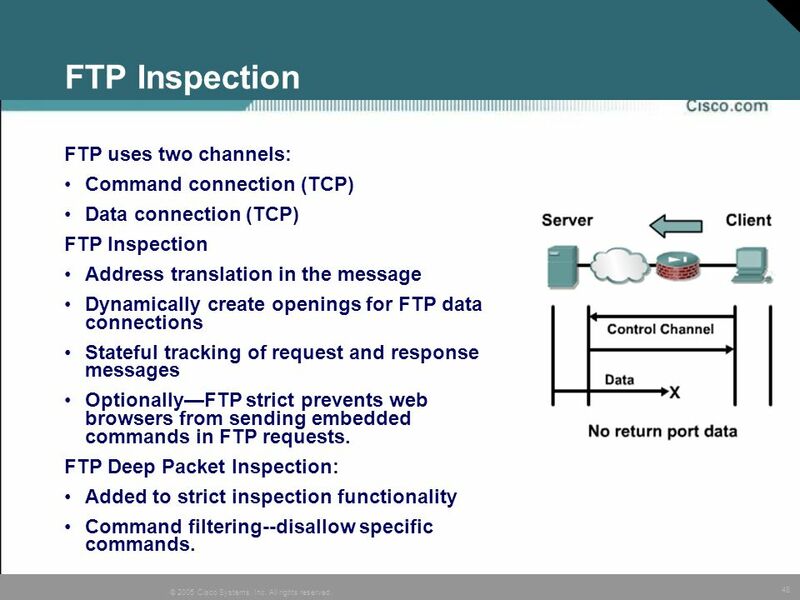 Data connection (TCP) FTP Inspection Address translation in the message Dynamically create openings for FTP data connections Stateful tracking of request and response messages Optionally—FTP strict prevents web browsers from sending embedded commands in FTP requests. 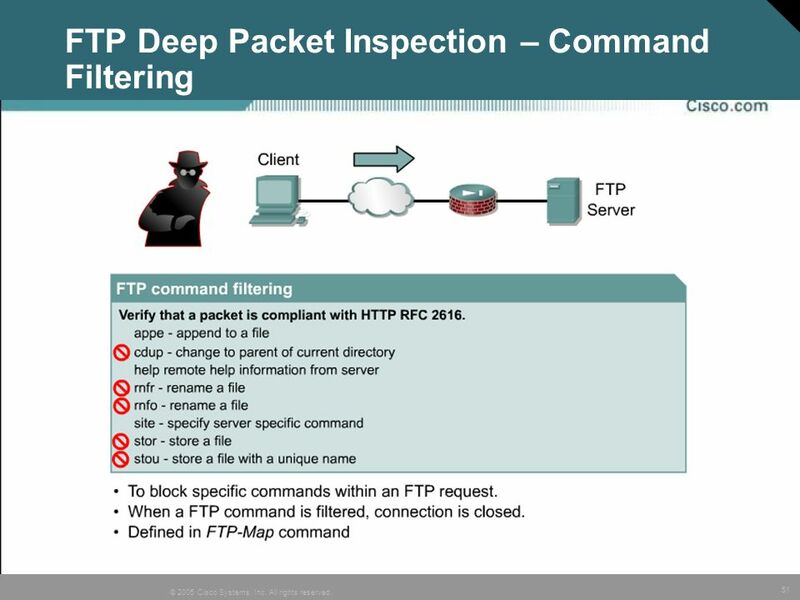 FTP Deep Packet Inspection: Added to strict inspection functionality Command filtering--disallow specific commands. Multimedia applications behave in unique ways: Use dynamic ports. Transmit a request using TCP and get responses in UDP or TCP. Use the same port for source and destination. 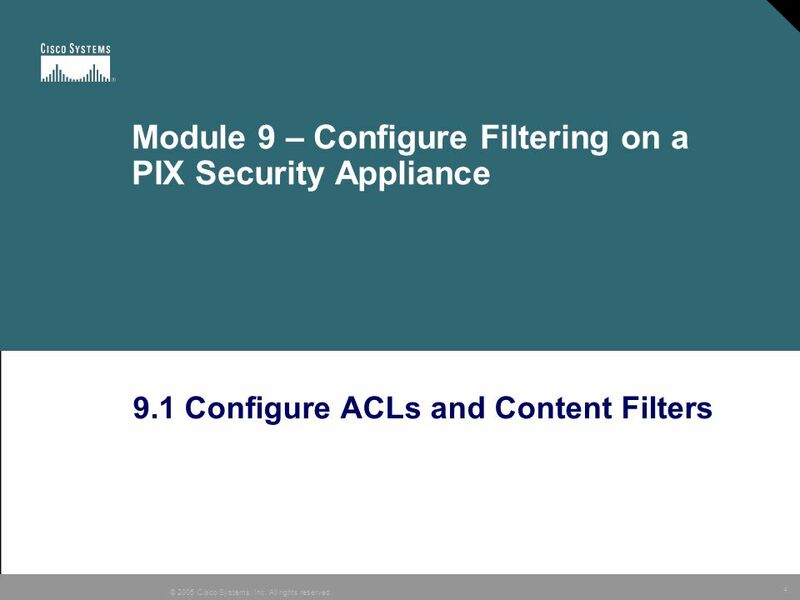 The PIX Security Appliance: Dynamically opens and closes conduits for secure multimedia connections. 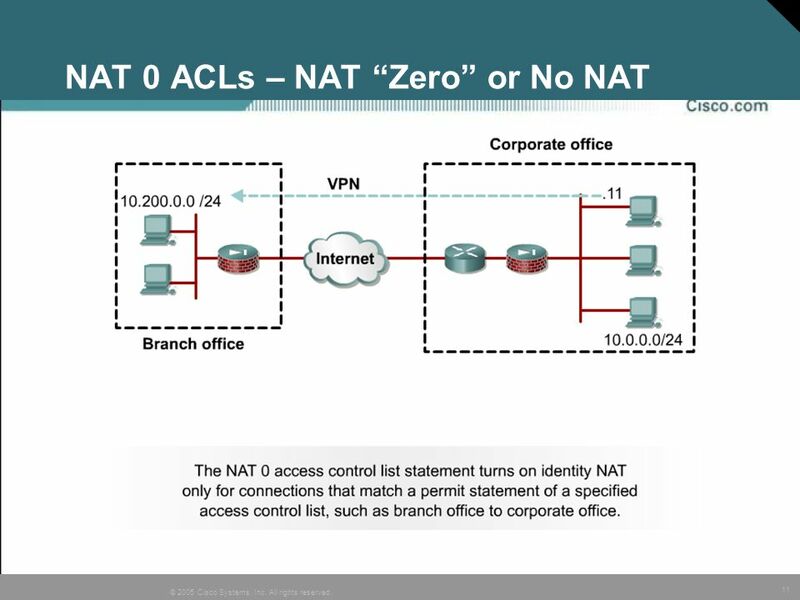 Supports multimedia with or without NAT. 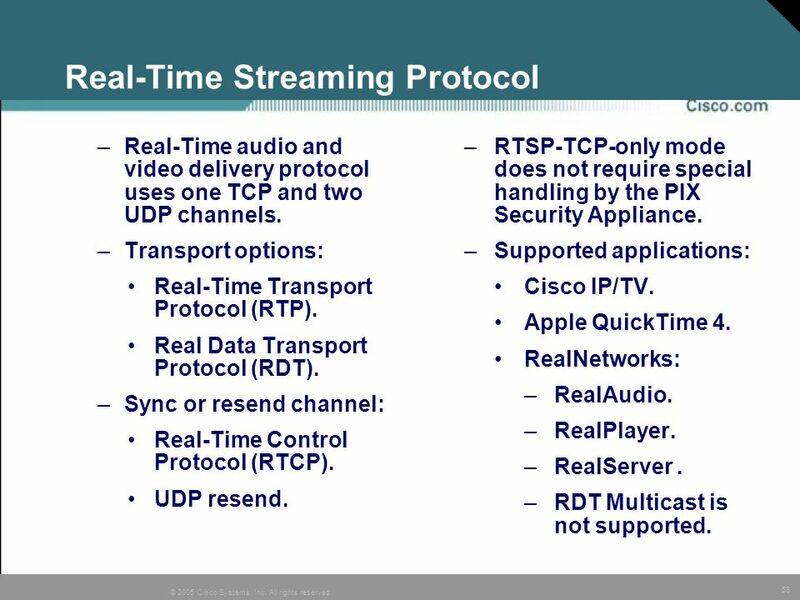 Real-Time audio and video delivery protocol uses one TCP and two UDP channels. Transport options: Real-Time Transport Protocol (RTP). Real Data Transport Protocol (RDT). Sync or resend channel: Real-Time Control Protocol (RTCP). UDP resend. 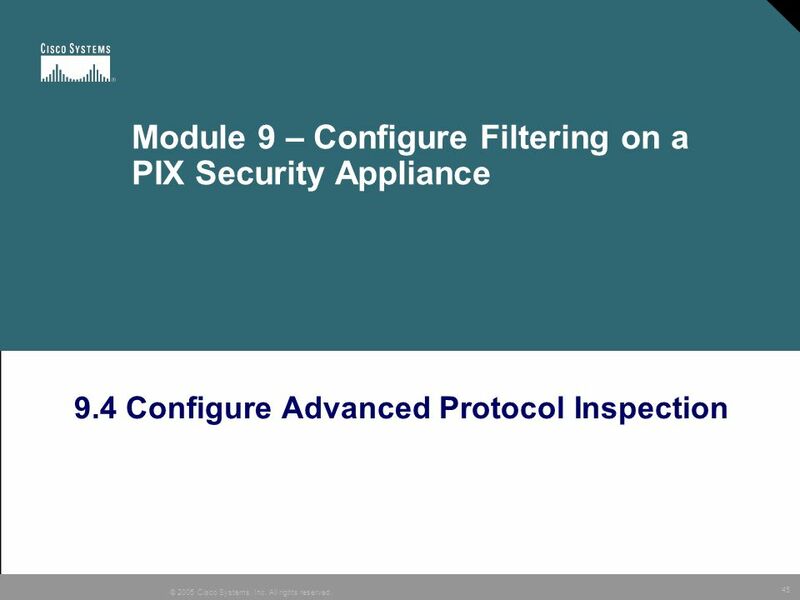 RTSP-TCP-only mode does not require special handling by the PIX Security Appliance. 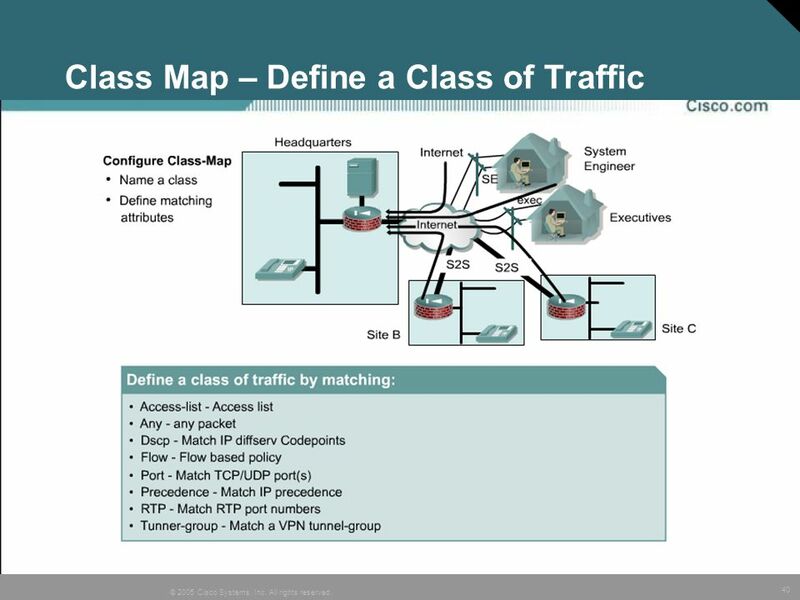 Supported applications: Cisco IP/TV. Apple QuickTime 4. RealNetworks: RealAudio. RealPlayer. RealServer . RDT Multicast is not supported. 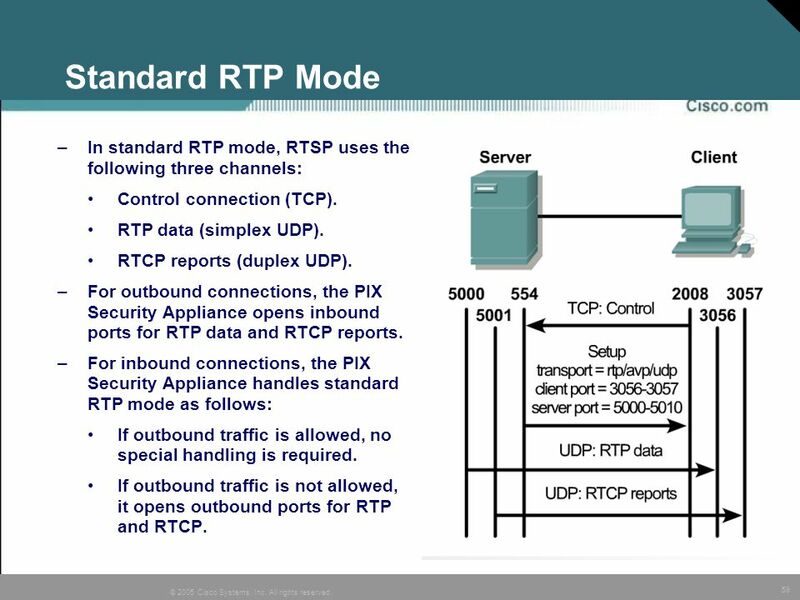 59 Standard RTP Mode In standard RTP mode, RTSP uses the following three channels: Control connection (TCP). RTP data (simplex UDP). RTCP reports (duplex UDP). For outbound connections, the PIX Security Appliance opens inbound ports for RTP data and RTCP reports. 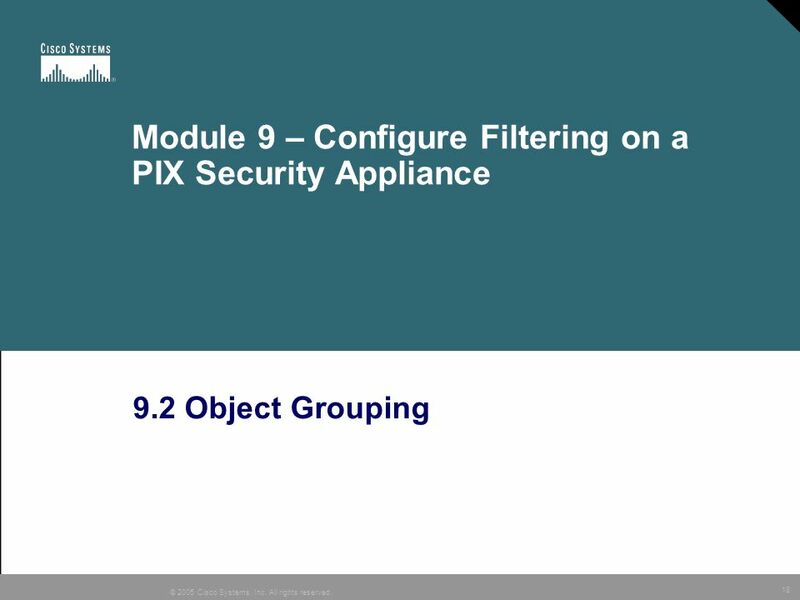 For inbound connections, the PIX Security Appliance handles standard RTP mode as follows: If outbound traffic is allowed, no special handling is required. 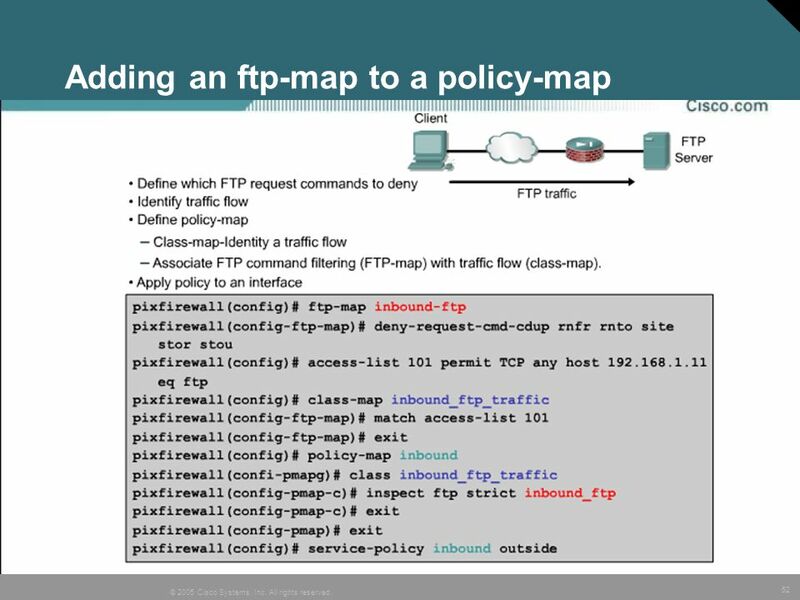 If outbound traffic is not allowed, it opens outbound ports for RTP and RTCP. In RealNetworks’ RDT mode, RTSP uses the following three channels: Control connection (TCP). 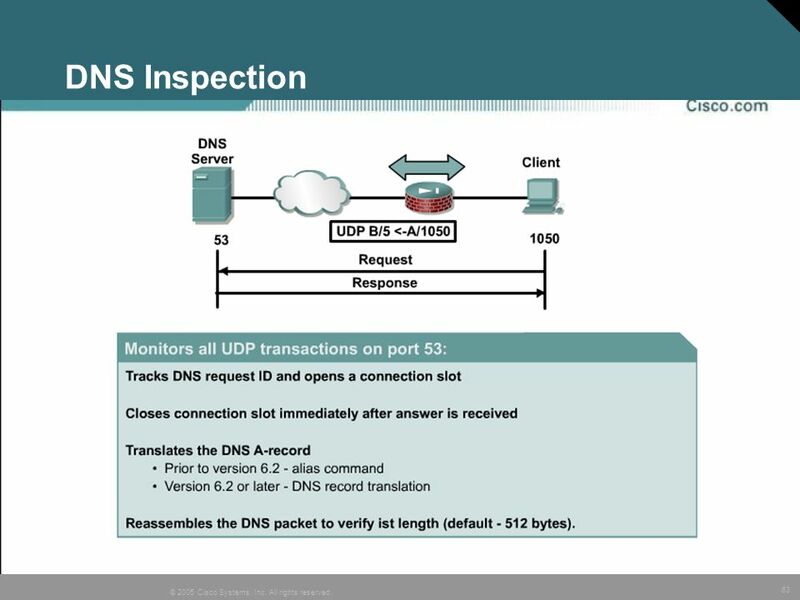 UDP data (simplex UDP). UDP resend (simplex UDP). 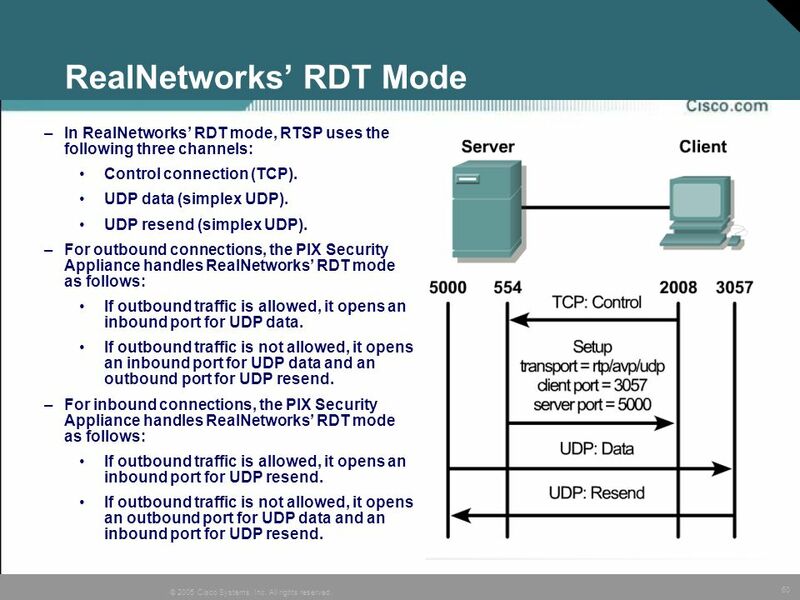 For outbound connections, the PIX Security Appliance handles RealNetworks’ RDT mode as follows: If outbound traffic is allowed, it opens an inbound port for UDP data. If outbound traffic is not allowed, it opens an inbound port for UDP data and an outbound port for UDP resend. For inbound connections, the PIX Security Appliance handles RealNetworks’ RDT mode as follows: If outbound traffic is allowed, it opens an inbound port for UDP resend. If outbound traffic is not allowed, it opens an outbound port for UDP data and an inbound port for UDP resend. 61 H.323 Supported H.323 versions: H.323 v1. 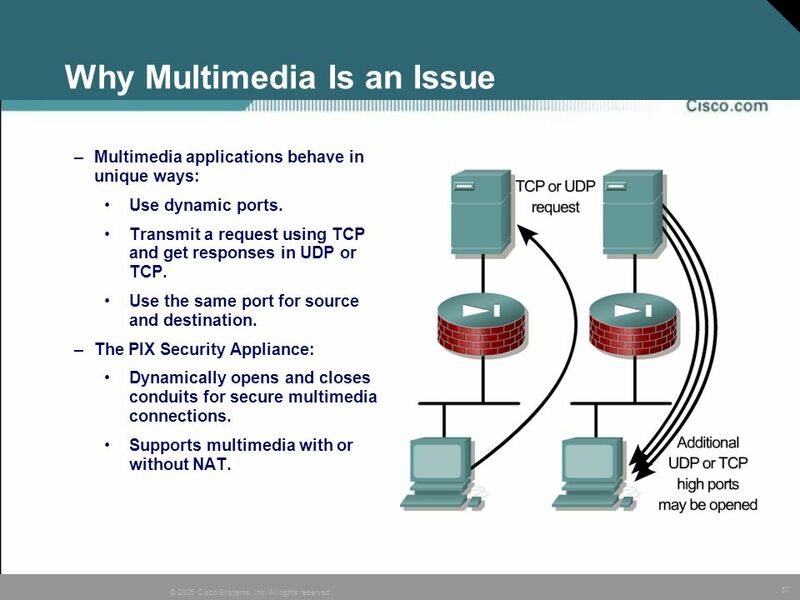 Real-time multimedia communications delivery specification uses two TCP and several UDP sessions for a single “call”. 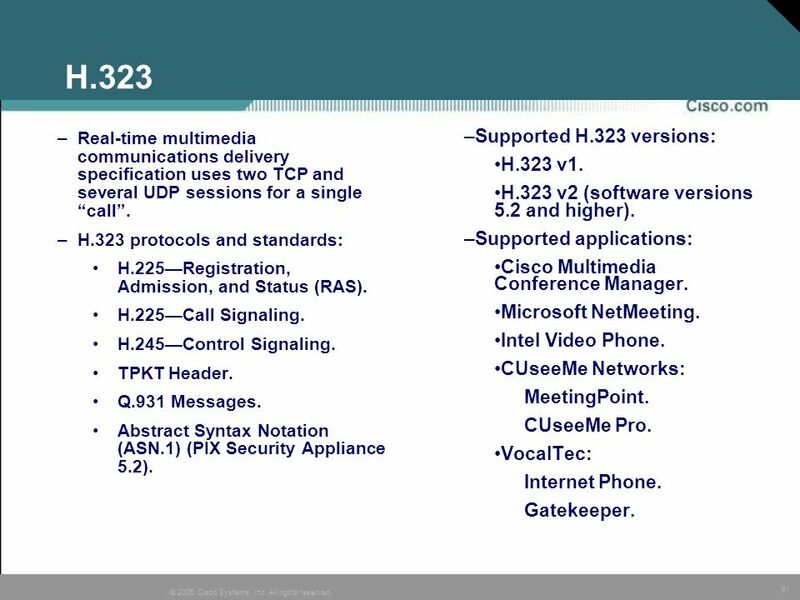 H.323 protocols and standards: H.225—Registration, Admission, and Status (RAS). H.225—Call Signaling. H.245—Control Signaling. TPKT Header. Q.931 Messages. Abstract Syntax Notation (ASN.1) (PIX Security Appliance 5.2). Supported H.323 versions: H.323 v1. H.323 v2 (software versions 5.2 and higher). Supported applications: Cisco Multimedia Conference Manager. Microsoft NetMeeting. Intel Video Phone. CUseeMe Networks: MeetingPoint. CUseeMe Pro. VocalTec: Internet Phone. Gatekeeper. Download their configurations from a TFTP server. Request an IP address and the IP address of a TFTP server from a DHCP server. 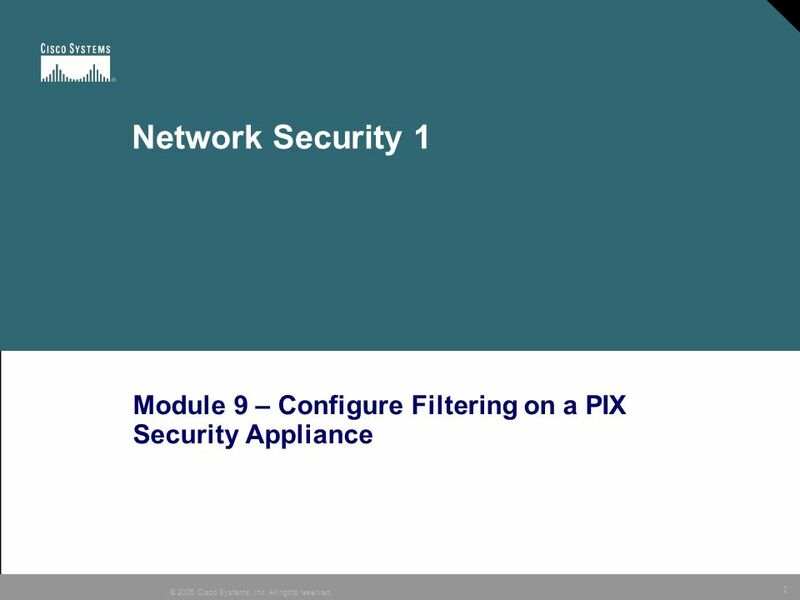 The PIX Security Appliance: Supports DHCP option 150 for providing the IP addresses of a list of TFTP servers. 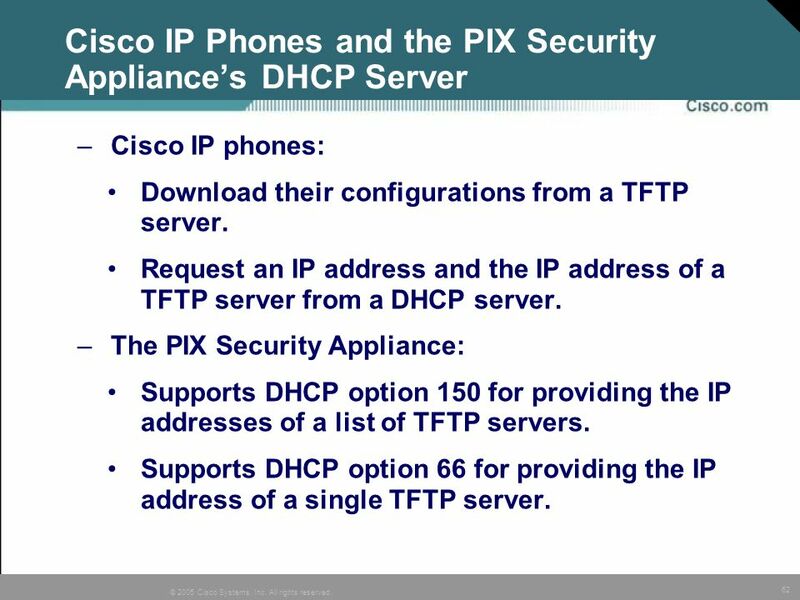 Supports DHCP option 66 for providing the IP address of a single TFTP server. 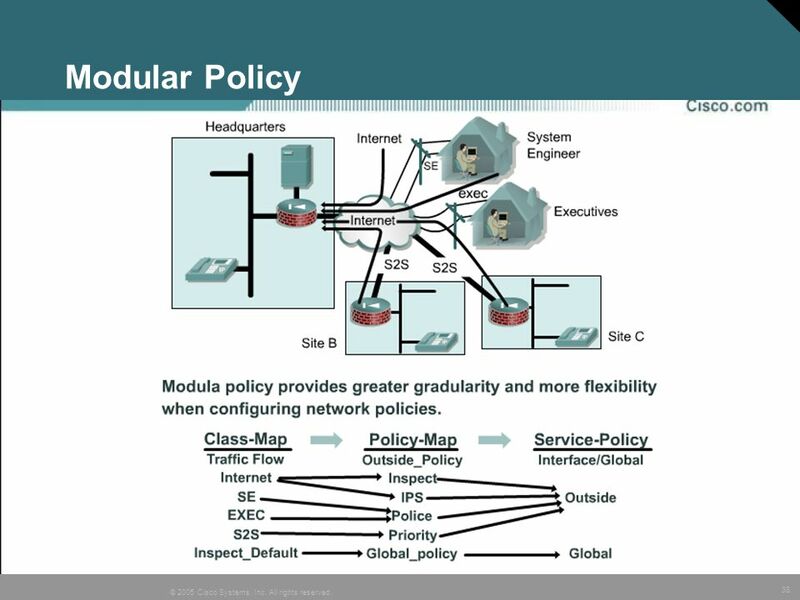 65 © 2005, Cisco Systems, Inc. All rights reserved. 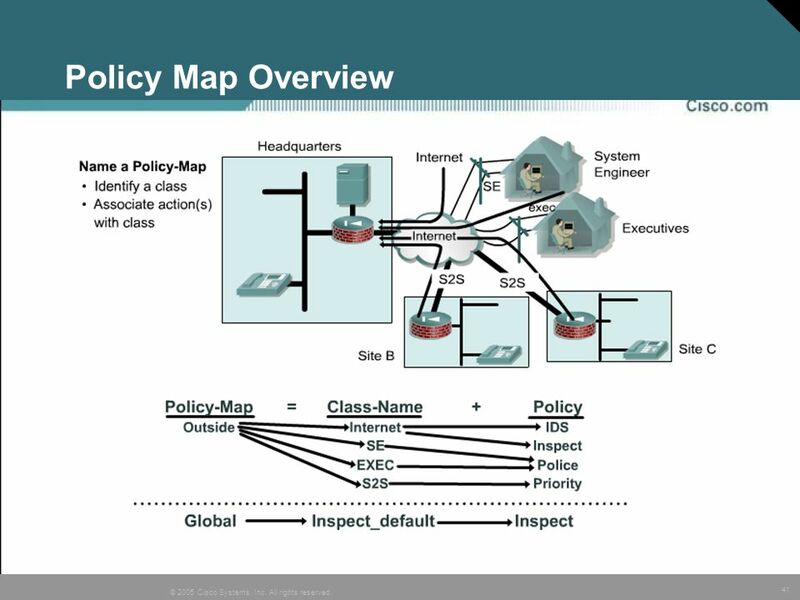 Download ppt "© 2004, Cisco Systems, Inc. All rights reserved." 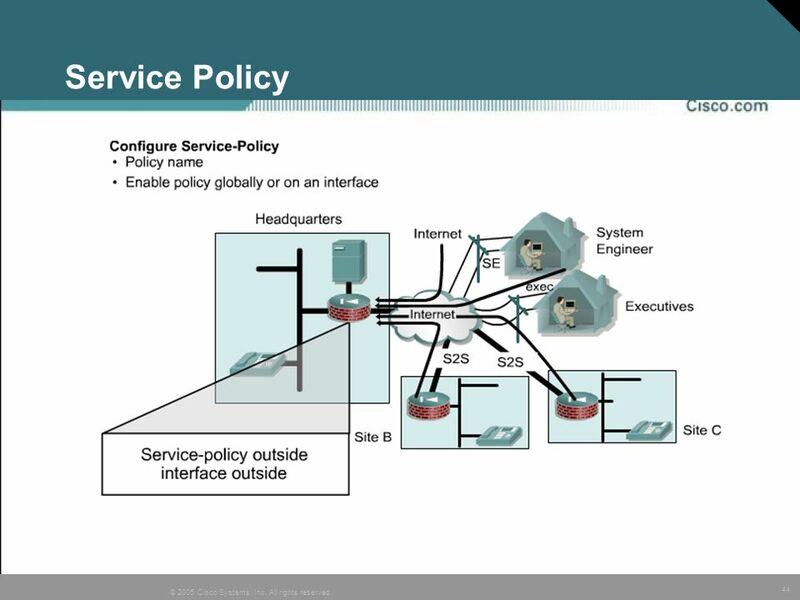 1 © 2005 Cisco Systems, Inc. All rights reserved. 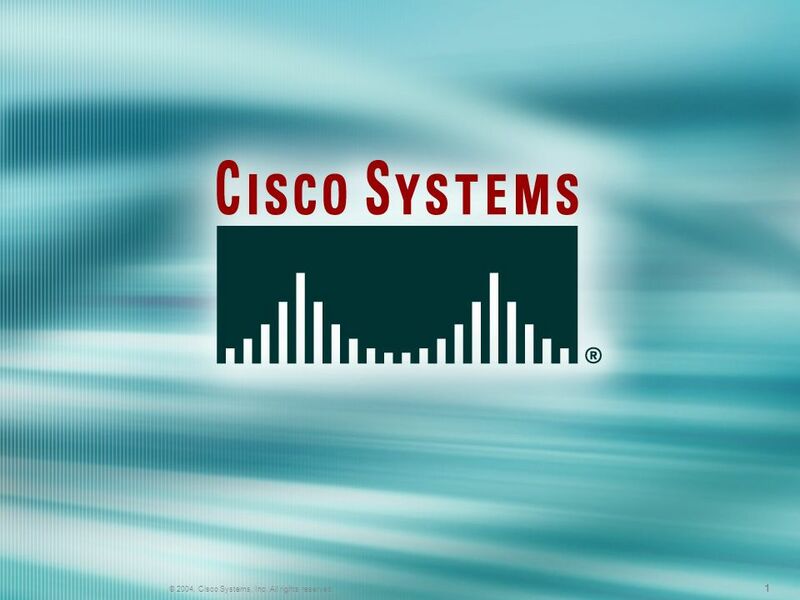 111 © 2004, Cisco Systems, Inc. All rights reserved. 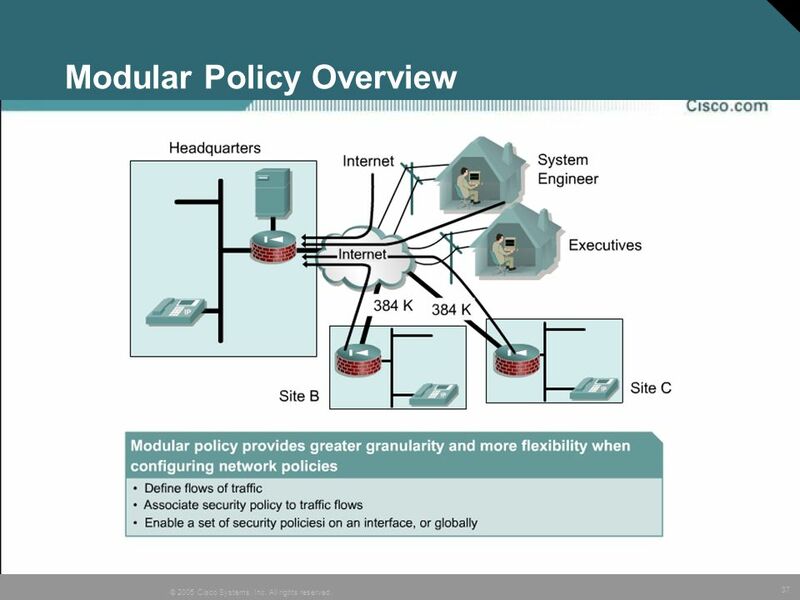 CNIT 221 Security 1 ver.2 Module 8 City College.